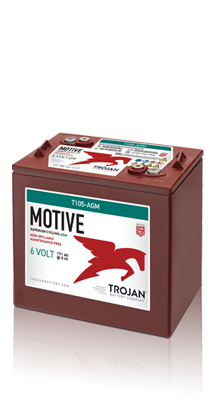 Trojan’s Motive Line of U.S.-made Absorbed Glass Mat (AGM) batteries are the only true deep-cycle AGM battery on the market today. 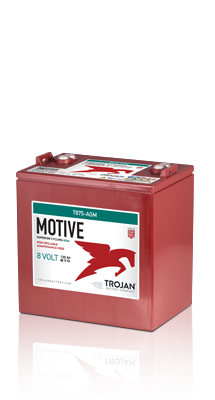 Motive AGM is engineered with an advanced technology feature set that provides outstanding sustained performance and total energy output, delivering the exceptional quality and reliability Trojan batteries are known for. As the world’s leading manufacturer of deep-cycle batteries for nearly 100 years, Trojan has developed a Motive AGM line with C-Max Technology™ for a wide range of applications which will benefit from its true deep-cycle design, including mobile work elevated platform, floor cleaning, golf, inverter, material handling, oil and gas, and recreation. 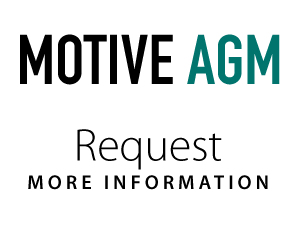 Motive AGM is also designed to power equipment used in locations where regulatory mandates require use of non-spillable batteries such as airports, healthcare facilities, shopping centers, educational institutions, etc. 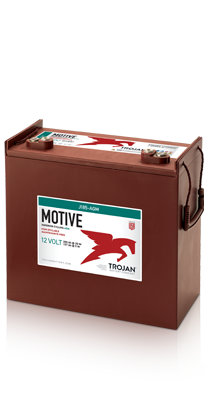 Motive AGM batteries are designed specifically for deep-cycle performance by Trojan’s engineering team, which boasts more than 200 years of combined expertise in deep-cycle battery technology. Built in the USA at our state-of-the-art manufacturing facility in Sandersville, Georgia, Motive AGM features premium components and superior manufacturing techniques. Motive AGM is also supported by Trojan’s technical support and Master Distributor network worldwide. Trojan’s Motive deep-cycle Absorbed Glass Mat (AGM) maintenance-free batteries feature a number of design elements to provide optimum performance. Robust plates and separators extend the life-cycle of Trojan’s deep-cycle AGM batteries while a computer-generated grid design is optimized for high-power density. Trojan’s deep-cycle AGM batteries are low temperature tolerant, shock and vibration resistant and have a low internal resistance for higher discharge current and higher charging efficiency. A. The number of minutes a battery can deliver when discharged at a constant rate at 80°F (27°C) and maintain a voltage above 1.75 V/cell. Capacities are based on peak performance. B. The amount of amp-hours (Ah) a battery can deliver when discharged at a constant rate at 80°F (27°C) for the 20-Hour rate and 86°F (30°C) for the 5-Hour rate and maintain a voltage above 1.75 V/cell. Capacities are based on peak performance. C. Dimensions are based on nominal size. Dimensions may vary depending on type of handle or terminal. Batteries to be mounted with .5 inches (12.7mm) spacing minimum. D. C.C.A. (Cold Cranking Amps) – the discharge load in amperes which a new, fully charged battery can maintain for 30 seconds at 0°F at a voltage above 1.2 V/cell. E. C.A. (Cranking Amps) – the discharge load in amperes which a new, fully charged battery can maintain for 30 seconds at 32°F at a voltage above 1.2 V/cell. This is sometimes referred to as marine cranking amps @ 32°F or M.C.A. @ 32°F. F. Dimensions taken from bottom of the battery to the highest point on the battery. Heights may vary depending on type of terminal. The Trojan Reliant AGM Battery is a staple for the self-containment systems here at Flyte Camp. The battery is tried and true, and surpasses any battery on the market today. We’ve experimented with other batteries on the market with very disappointing results and have had to replace them with Trojan Reliant AGM batteries every time.